When you're hiking around in the desert, you're obviously going to crave one thing in particular: water. That goes for times when the desert isn't even that hot. It's just dry. Even when it rains, the air is drier than the climates that I'm used to. But once that immediate need for water is met, I, personally, get a craving for some snacks. This trail mix really hits the spot. It's not super salty, which is good. I mean, I'm trying to cut back on salt since I might have high blood pressure and seeing some family members have strokes and other health concerns makes me want to avoid those trials later in life if I can. That said, I must admit this trail mix isn't super healthy in the sugar department. There's a good bit of added sugar, and it's quite sweet. For that reason, it doesn't take much to satisfy an immediate case of low blood sugar or a minor sweetness craving. Both the wife and I really enjoy this trail mix, but we've been nursing the bag for well over a week now. It just doesn't take much of it to satisfy our snacky sweet-tooths. 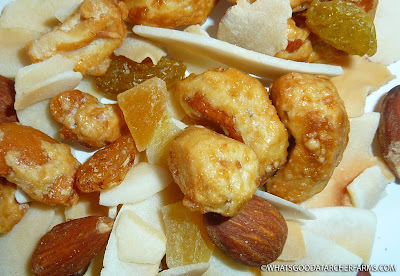 The coconut cashews are the base of the mix. They're sweet, coconutty, and have all the deliciousness of regular whole cashews. There are plenty of coconut chips and almonds, which help temper the sweetness of the mix. The dried fruit is also sweet, and it furthers the tropical vibe to the mix. The overall flavor is very complex, but the main essence is, as the title would suggest, very reminiscent of toasted coconut. The nutty and fruity flavors give it something even more special. 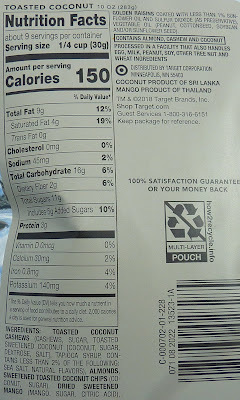 They actually import the coconut from Sri Lanka and the mango from Thailand. It makes the product all the more exotic, I suppose, though certain consumers might wonder why we couldn't source these fruits from our own continent for carbon footprint reasons, if not our own country, for "America first" type reasons. 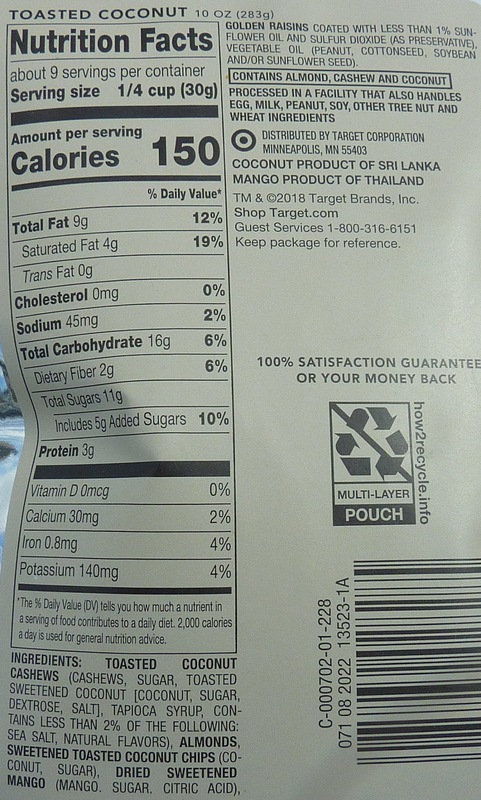 I won't get too political on this blog, since I don't in general, but seeing such notes on product packaging does make one raise an eyebrow once in a while. 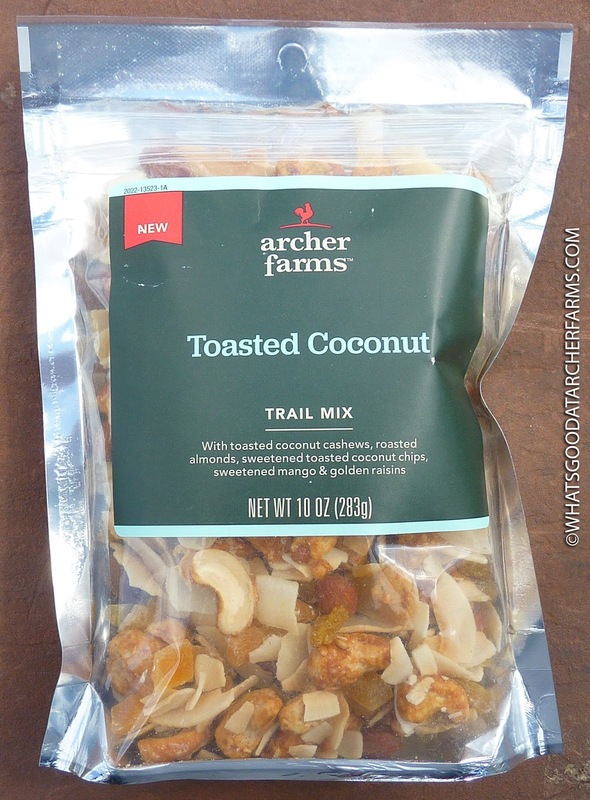 Archer Farms/Target might have relied more on the natural sweetness of the fruits and coconut and added less sugar to this mix. I think it still would have been quite satisfying. As is, this is still a very tasty, if perhaps a bit desserty, trail mix. Another winning snack from Archer Farms. $4.99 for the bag. We definitely would consider buying this one again.